How to transfer a gateway? 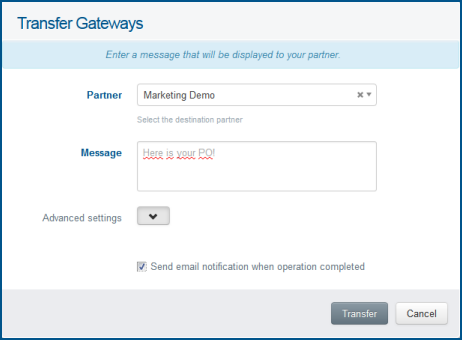 You can transfer one or several gateways to a partner. The receiving partner is then notified and can accept or reject the transfer. Only gateways not associated with any system can be transferred. Select the gateway to transfer then click on Transfer in the action bar or directly in the Actions column. A Transfer Gateways open. Add a message if needed. Check the box to be notified of the operation completion if needed. Your partner is then notified about the transfer and can accept or reject it.